Games for Windows - LIVE and SecuROM have been removed from the Steam version. Technical Issues section of the official forum. 9.11 Microsoft .NET Framework - Unhandled exception has occured in your application. All Windows versions activate on Steam, including retail. A well-written post on the Steam Users' Forums about the way the game handles save data. Note that this forum post is only relevant to the deprecated GFWL version. FXAA and up to 8x MSAA. Fix needed for 62 FPS cap; see High frame rate. To bind a FoV value of 100 to F10, add this line at the end of [Engine.PlayerInput]: Bindings=(Name="F10",Command="fov 100"). 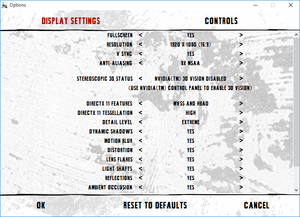 The game might revert this change when graphic or control settings are altered, especially when using the separate configuration tool. In case of multiple edits to an .ini file, it is useful to make a copy of the customized file and copy it over the reverted one when necessary, in order to avoid repeated manual editing. Under the [SystemSettings] section, add line MaxAnisotropy=16. 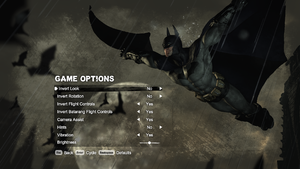 Separate inversion of look, rotation, flight controls and Batarang flight controls. 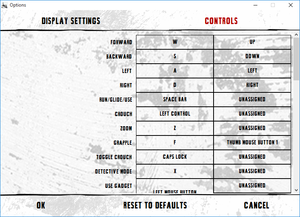 Under the [Engine.PlayerInput] section, change the value of MouseSensitivity=X to your desired mouse sensitivity. Depends on Windows Language preferences, for Spain must be on any configuration of Spanish. Depends on Windows Language preferences, for Latin America, Windows language must be on Español (México), For configure through UserEngine.ini, change ESN to ESM. By default the Windows system language takes over other preferences. Every time you start the launcher, the game takes over the launcher's language settings, so you should consider changing this, too. Put a semi-colon in front of each line except 'default=Int' and your desired language. 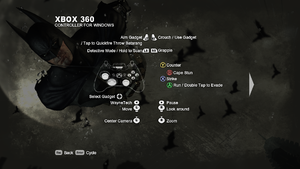 When using a controller, entering menus (such as the map) un-hides the mouse cursor and positions it in the center of the screen. Go to the Compatibility tab and check "Run this program as administrator"
Turn off PhysX and DX11, as both of these features are resource-intensive. Ensure you have the latest DirectX End-User Runtimes. After beating Joker in the Steel Mill, you may encounter a gray screen that looks to be a cutscene that refuses to load. It tells you you can skip it by clicking the left-mouse button, but doing so will have no effect. If you encounter this problem and you have the game on Steam, try validating your cache. Select "Check integrity of game cache files". The process might complete too fast (less than three seconds for a game of several gigabytes). If that's the case, launch the game and load up the menu. Press Alt+F4 and GfWL will helpfully inform you that you might lose unsaved progress. Click Yes to continue. Try validating your game's cache again. 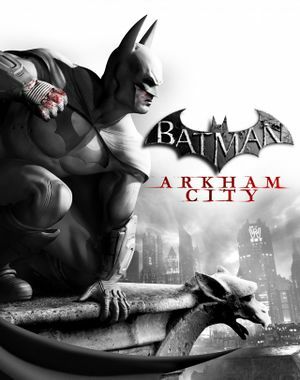 If validating your cache did not work or you do not have a version of the game on Steam, delete the game's local files (Steam -> Batman: Arkham City -> Remove local files), reinstall the game and try again. Luckily your saves are stored in the Steam Cloud. If problems persist, ensure sure you have volume set to max for Batman Arkham City in the volume mixer (click on the little speaker icon in the bottom-right of your screen in the system tray). 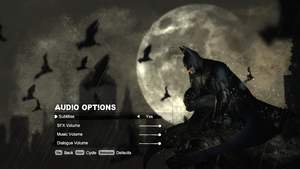 If you're in-game, just Alt+Tab ↹ out of the game and check if Batman Arkham City is set to max in the volume mixer. Another tip you could try is to go to Control Panel > Hardware and Sound > Sound > Communications Tab then select the "Do Nothing" radio button to permanently fix this issue. While able to do the "quickfire disarm" for Catwoman while using a gamepad, this move is unusable with a keyboard, as it has no button associated with it. Replace both KEY3 and KEY4 with "Unbound"
Sometimes Penguin statues may become invisible, and cannot be destroyed, but can be locked on with a batarang. Verify the game cache or reinstall the game. Open RivaTuner (the tool that comes together with MSI Afterburner), add the game file BatmanAC.exe, and activate or deactivate Custom Direct3D support depending on the global setting. Microsoft .NET Framework - Unhandled exception has occured in your application. Note: Users with macOS versions prior to 10.14 can select the branch mac_retail_11 - macOS 10.13.6 or older only from the Beta tab on Steam. This enables the game to run with the legacy OpenGL backend on macOS >= 10.9.5. ↑ 2.0 2.1 File/folder structure within this directory reflects the path(s) listed for Windows and/or Steam game data (use Wine regedit to access Windows registry paths). Games with Steam Cloud support may store data in ~/.steam/steam/userdata/<user-id>/200260/ in addition to or instead of this directory. The app ID (200260) may differ in some cases. Treat backslashes as forward slashes. See the glossary page for details. This page was last edited on 22 April 2019, at 08:12.